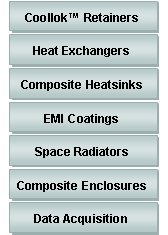 Space Simulation Capability: Measurements of flight hardware and materials such as composite and metals require a simulated space environment, with cryogenic temperatures and a hard vacuum control. 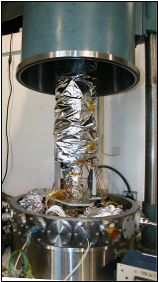 MII’s facility is dedicated to measuring electrical, thermal, and select mechanical properties in a space simulated environment. 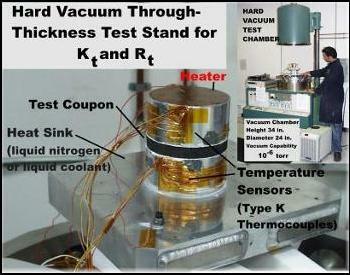 For thermal testing, hard vacuum eliminates convective heat transfer thus providing for simulated on orbit or deep space conditions. 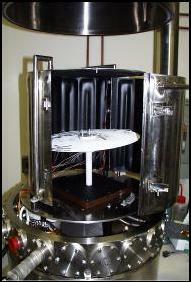 MII has developed multiple hard vacuum test fixtures for cryogenic thermal conductivity and other custom measurements. Chamber size is 30” in diameter with extended length to 120”. Minimum temperature attainable is typically down to –320°F and lower temperatures are available. Maximum vacuum attainable is 10-7 Torr. 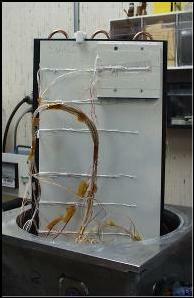 Connections to sensors and power lines run through hermetically sealed connectors in the base plates and other modified fixtures. 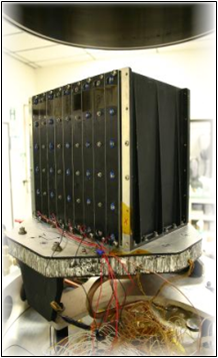 Hardware to include thermal doublers, heatsinks, and avionics packages are routinely tested. Materials such as advanced composites, thermal interface materials, ceramics, graphitic foams and carbon-carbon are tested to establish database properties and to help develop A-Basis and B-Basis allowable values for critical space applications.